KANAZAWA, Japan, March 21, 2019 /PRNewswire/ -- Researchers at Kanazawa University report in Nature Communications what causes some lung-cancer patients to have an intrinsic resistance to the drug osimertinib: AXL, a protein belonging to the class of receptor tyrosine kinases. The combined application of osimertinib and an AXL inhibitor is shown to limit intrinsic resistance to the drug. For treating cancer, drugs based on molecules known as tyrosine kinase inhibitors are sometimes used. One such tyrosine kinase inhibitor, called osimertinib, has been used to treat EGFR-mutated lung cancer with a certain degree of efficacy. (EGFR refers to "epidermal growth factor receptor", a protein that plays an important role in signaling from the extracellular environment to a cell.) However, in some patients, intrinsic resistance and inadequate response to osimertinib has been seen to occur. Seiji Yano from Kanazawa University and colleagues have now discovered that a particular protein known as AXL causes the resistance to osimertinib and the emergence of osimertinib-tolerant cells. The researchers first showed that in vitro, osimertinib activated AXL in EGFR-mutated lung cancer cells. Then, they demonstrated an inverse correlation between AXL and susceptibility to tyrosine kinase inhibitors; AXL expression correlated with a poor response to treatment with osimertinib and with early tumor relapse. Yano and colleagues checked whether drug-tolerant cells (cells with significantly reduced sensitivity to drugs) exhibited higher levels of AXL. Indeed, tolerant cells were found to display a higher expression of AXL compared to parental cells. 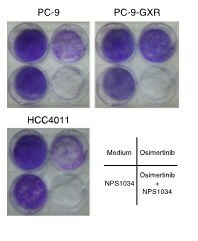 Application of an AXL inhibitor called NPS1034 led to a decrease in survival of the drug-tolerant cells. The scientists then investigated the effect of the AXL inhibitor combined with osimertinib in a mouse model. Treatment with only NPS1034 had no effect on the tumors. Treatment with only osimertinib initially led to tumor regression, but tumor regrowth was observed within 7 weeks. Simultaneous treatment with NSP1034 and osimertinib led to tumor regression within a week, and the size of the tumors being stable for 10 weeks. No adverse effects, such as weight loss, were observed during treatment. The findings of Yano and colleagues provide important insights into the molecular mechanisms causing the tolerance to osimertinib in EGFR-mutated lung cancer cells and, particularly, into the role of AXL — and the effect of inhibiting its activity. Quoting the scientists: "These results suggest that treatment during the initial phase with a combination of osimertinib and an AXL inhibitor may prevent the development of intrinsic resistance to osimertinib and the emergence of drug-tolerant cells in EGFT-mutated lung cancer overexpressing AXL." A tyrosine kinase inhibitor is a drug inhibiting (that is, preventing or reducing the activity of) a specific tyrosine kinase. A tyrosine kinase is a protein (enzyme) involved in the activation of other proteins by signaling cascades. The activation happens by the addition of a phosphate group to the protein (phosphorylation); it is this step that a tyrosine kinase inhibitor inhibits. Tyrosine kinase inhibitors are used as anticancer drugs. One such drug is osimertinib, used to treat EGFR-mutated lung cancer. AXL is a receptor tyrosine kinase — a tyrosine kinase consisting of an extracellular part, a transmembrane part ('sitting' within a cell membrane) and an intracellular part. AXL regulates various important cellular processes, including proliferation, survival and motility. In recent years, it has become clear that AXL is a key facilitator of drug tolerance by cancer cells. Seiji Yano from Kanazawa University and colleagues have found that this is also the case for EGFR-mutated lung cancer: a high expression of AXL correlates with resistance to osimertinib, a tyrosine kinase inhibitor, and the emergence of osimertinib-tolerant cells. Treatment with osimertinib alone, AXL inhibitor NPS1034 alone, and osimertinib and NPS1034 combined.